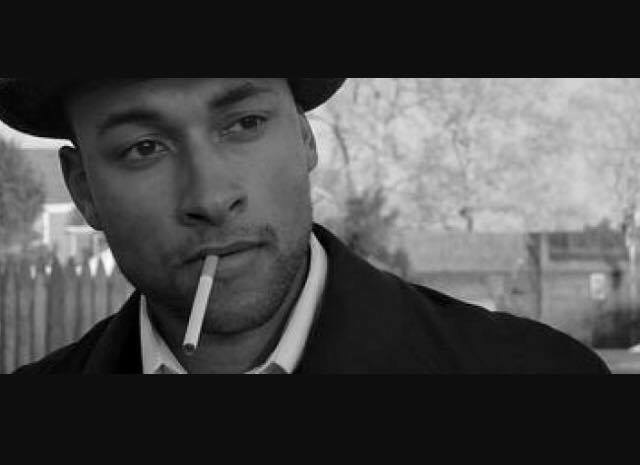 Inaugural writer and director Mike Falconi’s near seventeen minute short thesis film for The Art Institute of Philadelphia, “That Terrible Jazz”, is every bit as smooth, classy and elegant as its title musical genre suggests. It is complimented by the pulpy attitude one would expect from a 1930’s – 40’s noir. This Falconi has ardently fashioned his debut cinematic achievement after. Also, the narrative is similarly fitting in that it is packed with sly, diminutive, cryptic dialogue. This hallmark aspect is as intriguing, illusive and mesmerizing as ever. It is another of the fiction’s many trademark attributes. Regardless, it adds layers of additional mystery and sophistication to an already compulsively intriguing dramatic composition. The plot concerns the chain-smoking and heavily drinking protagonist and private Investigator Sellers (Ephraim Davis in an enactment which brings to mind Humphrey Bogart with a uniquely splendid and well-executed spin) and his attempts to locate a missing saxophone player. The ticking clock motif, another common quality of similar affairs, is utilized here. This comes into play as Sellers learns that the individual needs to be uncovered before the jazz band performs that night. It is an amusing jump-off point. Such is perfect for the scant form it is presented in. Likewise, the account is punctuated with an underlying intensity throughout. Falconi and his moviemaking crew, keeping the enigmatic traits of its brood in check, frame the yarn largely as one interrogation sequence after another. This administers supplementary respect for the roots of similar entries of its ilk. It also mechanizes incredibly well as a tried and true manner of delivering exposition. With several genuinely unforeseeable twists in tow to add to the attention-garnering at hand, Falconi develops those who populate the screen in a consistently engaging, charismatic and alluring fashion. These well-developed cinematic dispositions themselves endure as enigmatic as the lead himself. They follow the modus impeccably well of such a classically stylized entry. Such can also be said of Ellay Watson’s brilliant embodiment of Elizabeth Alksne. 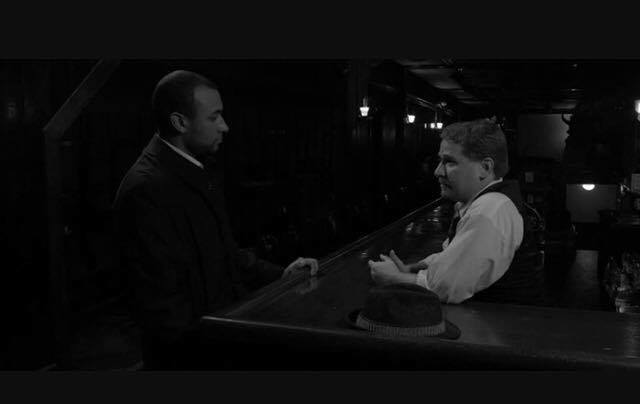 Timothy J. Cox gives us another of his many masterful turns in his portrayal of the barkeeper, Nicky. Cox’s always welcome presence is reserved for a small amount of the runtime. Still, he makes a certainly memorable impression. David A. Rodriguez is exceptional as Jimmy Calder. Jim Snyder as Gregory and John Rifici as Dean fare just as well in their respective depictions. Thomas Schmitt as Dallas, Bruce Clifford as Mac and Gyasi Howard as Wynn Dumont astound. Together these performers complete a cast of characters etched with both dimension and a hard-boiled edge. We, the audience, sit spellbound by everyone we meet herein. What also heightens and illuminates such a parallel is Stephen Grancell’s moody black and white cinematography. This is complete with beautifully done lighting that augments the visual splendor. Contributing to this appeal is Earl Stepp’s immersive, era appropriate music. Such sophisticated luster is treated by the dress of the aforementioned period. There are suits, ties and pork pie hats aplenty. With these elements in mind, this could’ve easily come off as mere imitation. Instead, the sum of this labor soars far beyond such a broad description. This is accomplished by issuing a tautly-knit, relentless pace. It is also assisted by sharp editing from Falconi and Grancell. Additionally, Falconi has crafted a screenplay that is smart, absorbing and proficient. The well-constructed piece makes exceptional use of its low-key sensibility. Furthermore, this rousing effort demonstrates phenomenal make-up work from Frances Gonzalez-Chavarria. It also exhibits incredible sound from Strepp. These jaw-dropping components illuminate this magnum opus dazzlingly. They help establish the competence resounding from every technical facet. Among its other wise moves is opening, as if being dropped in the middle of a scene, with Watson hiding her face in a pillow. The words are uttered: “You better end this, Betty. Because you don’t want me to.” Such a display grips us immediately. It urges us to put the broken portions of this seemingly broken puzzle together quickly. This is before the actual narrative ventures in that direction. Falconi’s production is compulsively watchable from its first frame onward. As the tale moves on, the same sense only accumulates. When the end credits arrive, with a grey moniker in quotations that recollects the days when crime sagas such as these dominated movie theaters, we realize that we have been riveted in the manner this exertion commenced upon throughout. Ending on a brilliant, suspenseful and pensive note that suggests the name of the effort represents the unpleasant goings-on of the leads’ daily lives, Falconi has given us a debut exertion that is sophisticated and clever. With a budget of only $1,000, Falconi has delivered a composition that mirrors the rugged gloss of an antiquated Hollywood production spectacularly. Falconi does this so well that one cannot help but feel awestruck by how well he creates the illusion of watching an eighty year old classic. “That Terrible Jazz” is phenomenal. This is true as an example of old-fashioned storytelling as well as its enduring contemporary hold. It is also a promise of great things to come for Falconi. His contribution behind the lens is fantastic. Yet, this splendidly crafted love letter is striking all around. Falconi’s exertion proves that the genus it ardently models itself after needs a modern-day resurrection. It also subtly suggests that some definitions of ‘cool’ are eternal. They continue to excite and compel us as years stretch on and pass. Such is just one of the many reasons why Falconi has concocted both a wonderful love letter and a sight well worth seeing.